Stress is a fact of life – it is a phenomenon that we cannot avoid day in and day out. Stress is the physical, emotional and thinking reaction to a stressor. You are running late for work, and you find yourself stuck in traffic at a construction site. You are scheduled to be in a very important meeting at work. You have forgotten your cellular phone at home. Consider for a moment how you may feel in this situation, also think about the thoughts that you may be having given this situation. One person may feel tense and their heart begins to beat faster. This same person may be thinking that they will be called into their boss’ office for a stern talking-to. Another person may not note any physical changes and may be thinking that there is little they can do about the situation and they will get to work a quickly as they are able. It is unrealistic to think that we can completely eliminate stress from our lives. Stress has been portrayed as something that we should eliminate for our health and well-being. In fact, the ability to respond to stress is an evolutionary mode of survival. The fight or flight response ,stress response allows us to respond to challenges or in emergency situations – we are programmed as human beings to respond in this way, positive stress. You may be able to recall situations during which you were in fight or flight response mode. This physiological and mental response elicits an increase in breathing rate, heart rate, blood flow to muscles and mental activity. In this sense, stress is very useful and helpful. Stress can become negative and may not be very helpful at times. You can think of negative stress as distress – this occurs when one’s level of arousal, stress response is too high for too long. Our minds and bodies are not designed to cope in this way, and can impact on health and wellness over the long-term. Stress management is a collection of skills and strategies that one can use to cope with the stress they experience. The goal of stress management is not to eliminate stress completely, but rather to bring it to a manageable level. Each individual has their own limits or capacity for stress; some people find that the presence of some stress keeps them alert, motivated a challenged, whereas other people need to keep their stress levels much lower to function optimally. We often hear of the term stress headache or the notion that if stress were better managed, people may not be troubled by headaches. It is important to clarify that stress does not cause migraine headaches. Rather, stress and or the let-down period after stress can contribute to triggering migraines and may worsen the headache pain. Stress is the most commonly identifed migraine trigger among both men and women. This study also highlighted that the period of letdown from stress is a trigger factor for approximately one-quarter of individuals. This does not mean that individuals with migraine do not manage stress well, however, it does indicate that stress can be a contributing factor in one’s headache experience ,i.e., frequency, duration and severity. 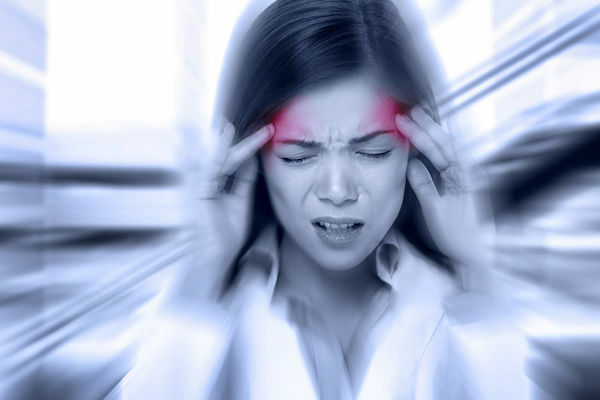 Those who are not prone to migraines will not get a migraine during or after stressful periods. Those who are genetically susceptible to migraine need to pay particular attention to their stressors, and be able to recognize when stress has become problematic. Those with migraine may feel that their headaches in and of themselves are a stressor. Pain is a physical and emotional stressor, and as such, the body responds to pain as it does to stress. As part of the stress response, the body releases stress hormones, which can alter the processing of pain information in the body, and one may experience pain more intensely. These are questions that can help you pause for a moment to consider how stress affects your day-to-day functioning. How do you currently manage your stress? Learning to recognize when stress is problematic and using effective stress management strategies is a skill. Stress management is not like a recipe – individuals experience stress differently, and what provides relief also differs from person to person. adopt healthy lifestyle habits to make you more stress resilient ,including eating a well-balanced diet, getting regular exercise, ensuring you get the sleep you need, and avoiding smoking, excess caffeine and alcohol intake. Breathing is something that we do automatically, and often we do not focus on our breathing as we go about our daily activities. Breath is the essence of life and learning to pay attention to how you breathe can benefit your overall health and well-being. As infants, we are belly breathers, but many of us become chest breathers out of habit. Chest breathing does not allow us to take full advantage of our lung capacity, and subsequently we take in less oxygen than we potentially can. The diaphragm is a large dome of muscle that separates your lungs from your abdomen. The diaphragm is the main muscle involved in breathing – other muscles of the chest and upper body assist. When you inhale, the diaphragm contracts and pulls downward, allowing more air to enter the lungs. On exhalation, the diaphragm moves up and inward, as air is pushed out of the lungs. Diaphragmatic or deep breathing can allow you to achieve a state of physical and mental relaxation. When we are tense, anxious, feeling stressed or experiencing pain, our breathing tends to become more rapid and shallow. Deep breathing calms the autonomic nervous system, which is responsible for the body’s reactions to perceived stress. preparation for further relaxation practice ,i.e., meditation, etc.